Explosions! Giant snakes! Lots of running! 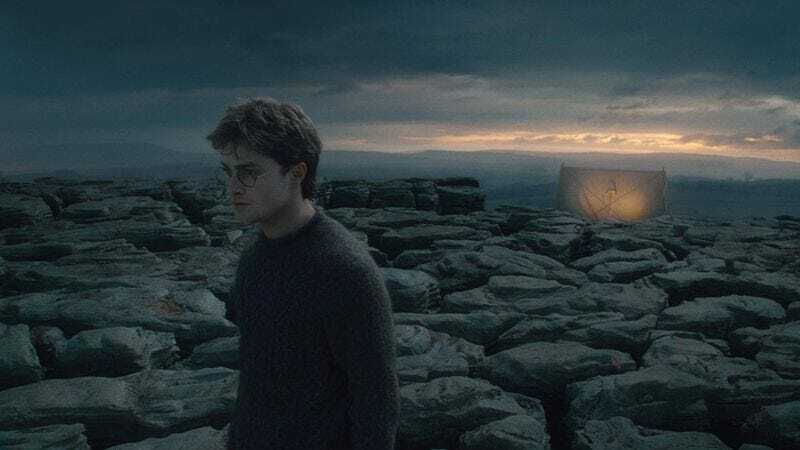 There sure is a lot going on in the new trailer for Harry Potter And The Deathly Hallows, the final installment of the mega-popular book/movie franchise. This trailer covers part one of the two-part movie—if you want a spoiler of where in the story the split occurs, click here—and thankfully glosses over the endless wandering in the forest that hindered the final book (though it does feature the brief return of the Jar Jar Binks of the Potterverse, Dobby the house elf). The two-and-a-half minute trailer spends a good bit of time establishing the final book’s grim, war-torn atmosphere—Harry in graveyard, Harry in the middle of a vast wasteland, Harry yelling about something—but explodes into a series of epic showdowns and creepy shots of Voldemort (who’s badly in need of a good manicure). Then there’s that beefed-up version of John Williams’ “Hedwig’s Theme,” which gives Potter fans everywhere goosebumps…. oh here, just watch it and see for yourself.